Alan helped us purchase our van! He made it easy and quick! I love how they do a 24 hour test drive! Helped so much in deciding on the perfect van! Allen is a great guy. Great job! Allen was low key, low pressure, and very easy to work with! Much of the deal was done before we got there via phone and text messaging. They even transferred my brush guard for me! My previous truck came from Thys in Tama/Toledo, and will definitely look them yo again! 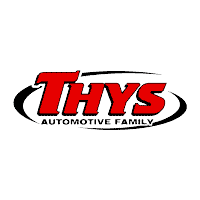 Went to the thus auto in belle plaine and had a wonderful experience everyone was very friendly and helpful I found the car I've always wanted and the process of purchasing it's went so smoothly Susie and Dave were great !!!!! Kris and Joel in Blairstown have outstanding customer service and are AMAZING! We totaled a vehicle and within a couple of days they had us back on the road. They answered every question we had, treated us very fair, and continue to help us every way they can. I can go on and on about how happy we are with them and how smooth of a truck buying experience we had. If your looking to buy new or used i would choose this local small town dealer!